Why Stop at One Campaign to Legalize Psychedelic Mushrooms? Oregon Has Two—and They Don’t Get Along. The leaders of Oregon's psilocybin ballot initiative say a rogue canvasser is bent on destroying them. He says that's nonsense. Oregon's fall 2020 ballot may feature a first-in-the-nation measure to legalize psilocybin—the psychoactive component in so-called magic mushrooms—when taken under the supervision of therapists. If this legalization campaign is unusual, so too is the effort to gather signatures, which has devolved into a bizarre fight. The chief petitioners behind Initiative Petition 12, Beaverton therapists Tom and Sheri Eckert, have filed two complaints with the Oregon secretary of state. They allege that a disgruntled former campaign employee, Christopher Abrahamsen, has become a rogue canvasser, improperly soliciting funds and squirreling away signatures that could put mushrooms on the ballot. "It appears [Abrahamsen] is invested in our failure, which he attempts to facilitate in a variety of ways," says Sheri Eckert, "including, apparently, by withholding signatures." It's not clear what Abrahamsen and the splinter group, a nonprofit called Mushroom PAC 2020, are up to. He says the group is another avenue to legalizing psilocybin. The Eckerts say it's an effort to siphon away their fundraising and undermine the signature-gathering campaign. When asked exactly how much money Mushroom PAC 2020 had raised, Abrahamsen told WW: "I don't know, I don't manage those numbers. I just go out and do my personal thing every day." Oregon has long been a haven for those who value the state's relaxed attitude toward mind-altering substances. In 1973, it was the first state to decriminalize cannabis—and was on the vanguard of legalizing first medical pot, then recreational weed. In 2017, Oregon's recreational cannabis industry generated $78 million in tax revenue. Psilocybin, known colloquially as "shrooms," is an illegal Schedule I drug at the federal level, meaning that no official medical use has been approved for the drug. But a growing body of scientific research by John Hopkins University and UCLA offers evidence that psilocybin could be a valuable tool in treating anxiety and depression. That's why the Eckerts decided to appeal to Oregon voters, as cannabis advocates had before them. They'll need to collect 112,200 valid signatures by July 2020 to place IP 12 on the November 2020 ballot. 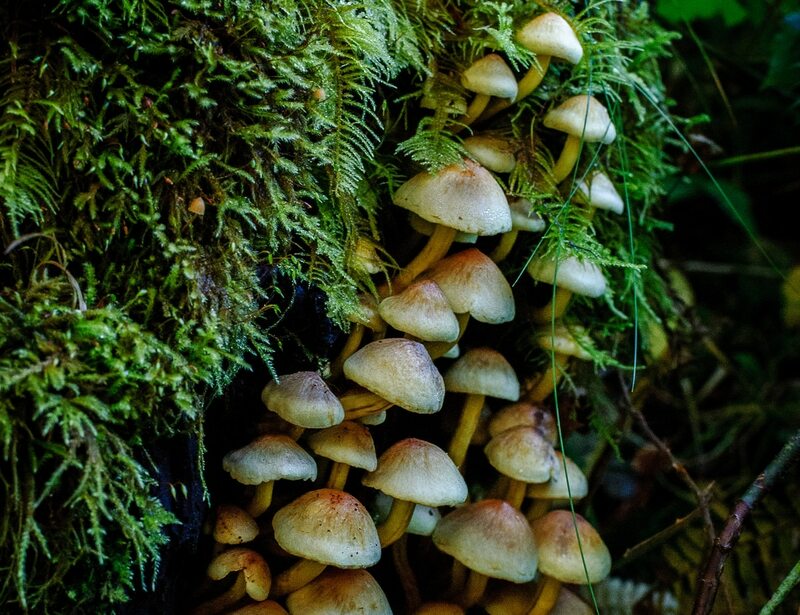 "When used in a therapeutic context, psilocybin, which is non-toxic and non-addictive, could address the mental health crisis here in Oregon," says Sheri Eckert. "That is why we are advancing a science-based approach." The Eckerts hired Chris Abrahamsen in the summer of 2018 on a week-to-week contract to be a canvasser for campaign contributions. He had experience on previous campaigns, including working for Greenpeace and on a cannabis legalization measure in 2013. "[Chris] was positive and ambitious at first," says Sheri Eckert. "We wanted to help him succeed." It was a short-lived partnership. The Eckerts fired Abrahamsen last August, saying he became "distrustful, disgruntled and often combative" when he wasn't promoted. The Eckerts first filed a complaint with the secretary of state in January alleging that Mushroom PAC 2020 and Abrahamsen illegally solicited funds by purporting to support IP 12. The Eckerts filed a second complaint March 28, alleging Mushroom PAC 2020 is illegally gathering signatures for the measure (also called the "Psilocybin Service Initiative"). "Mr. Abrahamsen, Mushroom PAC 2020 and its employees appear to be violating Oregon's constitutional pay-per-signature prohibition," the complaint reads, "and Oregon's initiative petition signature collection law and regulations." Abrahamsen says he's only a consultant for Mushroom PAC 2020—even though the nonprofit is registered in his name as of press deadline—and says any contributions he raises go to the wider cause of raising awareness about the benefits of psilocybin. "I helped start [Mushroom PAC], but I'm acting as a consultant," Abrahamsen said. "I don't have any ties to the organization." After he founded Mushroom PAC, the Eckerts say Abrahamsen started sending them harassing messages via Facebook. In one message provided by the Eckerts to WW, Abrahamsen allegedly wrote Nov. 28, 2018: "We have now placed a curse on you. The mushrooms know what you've done. And you will now have that curse upon your life and your marriage." In another, sent Jan. 29, 2019, Abrahamsen allegedly promised to "begin calling news sources and letting them know y'all are going to fail and so we are starting a new bill." The Eckerts' elections complaint says Abrahamsen is siphoning off contributions—by telling donors the money will go to IP 12 and that donors are eligible for a tax write-off. The complaint also provides Facebook posts showing Mushroom PAC 2020—and Abrahamsen—bragging about collecting hundreds of signatures. Legally, this may be allowable: Groups that merely support an initiative petition—but are not the chief petitioner—need not file with the Secretary of State's Office until the petition qualifies for the ballot. But the Eckerts say their campaign's not getting the signatures, or the money. It's not known how much Mushroom PAC 2020 has raised, but in a December interview, Abrahamsen told Rooster magazine the group had collected over $10,000. According to Tom Eckert, Mushroom PAC has sent a total of $300, even though the group promised via email early on to "deliver large single checks to the Petition Committee on a weekly basis." "Needless to say, that didn't happen," says Sheri Eckert. The Eckerts also believe Mushroom PAC 2020 is collecting signatures. Abrahamsen says that's not true. "I can tell you for sure we do not collect signatures on behalf of the initiative at all," Abrahamsen tells WW. "We do not and never have collected signatures." But in the second complaint filed by the Eckerts, it says they've received 50 signatures from Abrahamsen, even though he has bragged on Facebook about gathering at least 400. Abrahamsen says he's distanced himself from Mushroom PAC 2020. The group's co-founder, Bryan Kim, alleges to WW by email that the Eckerts are spreading lies about the nonprofit's efforts. "If you have been informed that we are in violation for having failed to register as a PAC, you have been misinformed," wrote Kim in an email. "If you have been informed that people separate from the petition committee are not allowed to collect funds and make expenditures for the purpose of supporting a petition committee's initiative, you have been misinformed." The Eckerts say they're fed up. "It is a horrible thing to know the public is confused, deceived and donating their money and signatures to a campaign that never receives either," says Tom Eckert. "It is also extremely frustrating that these funds remain completely unaccounted for."